Mineral Deficiencies – common among atrial fibrillation patients. Minerals, vitamins and herbs have a long and consistently safe track record. Nearly half of the people in the US take supplements every day. Danger of Too Much Calcium! Unfortunately a great number of physicians are not well versed in recommending or supervising nutritional support and quite often, will dismiss your inquiries about nutritional supplements. 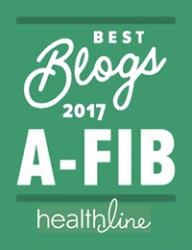 You may need to work with your doctor to determine the benefit of supplements for your A-Fib health. Remember: The authors of this website are not medical doctors. Consult with your doctor before adding any minerals or supplements to your treatment plan. They may interfere or interact with the medications you are taking. In addition, you may need closer medical supervision while taking minerals and/or supplements. Anyone in A-Fib is almost certainly magnesium deficient. While Magnesium (Mg) is one of the main components of heart cell functioning, it seems to be chronically lacking in most diets. Magnesium deficiencies range from 65% to 80% in general populations in the US and globally. At least 80% of Americans are deficient in magnesium. Other Western countries today exhibit similar deficiencies. Most US adults ingest only about 270 mg of magnesium a day, well below the modest magnesium RDAs of 420 mg for adult males and 320 mg for adult females. This creates a substantial cumulative deficiency over months and years. Magnesium used to be plentiful in fruits, vegetable and grains, but decades of industrial-scale farming have stripped the soil of minerals like magnesium. One study found that the nutrient content of crops has declined by as much as 40% since the 1950s. In addition, we no longer absord magnesium by bathing in or drink natural water that is high in magnesium—instead, we’re drinking and bathing in tap water that’s devoid of magnesium. Therefore, it’s now almost impossible to get adequate amounts of magnesium from a healthy diet. Low magnesium is often difficult to detect. In addition to an irregular heart, other physical signs include tics, muscle spasms and cramps, seizures, and anxiety. Common blood tests are poor indicators of your Magnesium level because Magnesium does its work inside the cell (intracellular), not in the blood. Blood “serum” levels of Magnesium are misleading. The RBC intracellular test gives the average level of Magnesium in the cells for the past four months. (A normal lower limit is 33.9 mEq/IU191.) Combined with your symptoms, the RBC analysis should indicate if you’re Magnesium deficient. 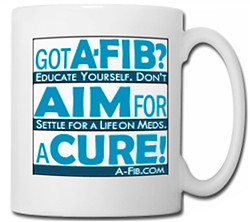 Even without the tests, if you have A-Fib you can take it for granted that you need more Magnesium. VIDEO 1: “The Best Way to Supplement Magnesium” with Dr. Carolyn Dean, author of The Magnesium Miracle, talks about supplementing magnesium, assuming that most people don’t have diets that can supply enough. (3:04) Published by iHealthTube.com. What Kind of Magnesium Supplement? But to insure you’re getting the amount of magnesium you need, it’s often necessary to take magnesium in supplemental form, in addition to foods rich in magnesium. • Angstrom Magnesium (sublingual ): 99.9% pure magnesium; liquid applied under the tongue; Such as Mother Earth Minerals Angstrom Minerals, Magnesium-8 ozs. It may take as long as six months to replenish your intracellular magnesium levels. Start slow: It’s prudent to start off with very low doses of oral magnesium such as 100 mg. (Excess magnesium or magnesium sensitivity can cause loose stools and diarrhea which is counterproductive, because of the loss of electrolytes.) Increase the dosage of magnesium every 4-5 days. It may take as long as six months to replenish your intracellular magnesium levels. Since the kidneys excrete excess magnesium, it’s rare to find cases where magnesium exceeds optimal levels, with the exception of people with kidney disease. Intravenous Magnesium: Another form is Intravenous (IV) Magnesium Sulfate. This is the fastest way to restore normal heart rhythm. It is a recognized therapy worldwide, but not generally in the U.S. Dr. Julian Whitaker in Newport Beach, CA performs this therapy (www.drwhitaker.com). Magnesium Chloride bath flakes: Similar to Epsom salts (Magnesium sulfate), the molecular structure of Magnesium Chloride is different and is much more easily absorbed into the body. Soak for 20-30 minutes in a bath with 2 cups of bath flakes, any brand will do. Can be used in conjunction with magnesium tablets. You can also make an Magnesium spray—one part salts to one part hot water. Place in a spray bottle and mist the chest. Let it dry on the skin. Transdermal or “Topical” Magnesium Oil: If oral magnesium causes bowel sensitivity, an alternative (or an additional source of magnesium) is Magnesium Oil. It’s applied to the skin and is absorbed directly into your cells, bypassing the digestive system. An example is Ancient Minerals Ultra Pure Magnesium Oil which is odorless and comes in a spray bottle. (One method is to apply a fine mist to arms and/or legs, then massage in. Wash off in 20 minutes.) Eight sprays of magnesium oil delivers approximately 100 mg of magnesium to the skin. 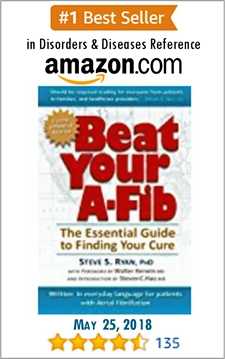 For recommended A-Fib related products, see Steve’s Shopping Guides to supplements, books, DIY heart rate monitors and more. Too much calcium (Ca) can excite the heart cells and induce A-Fib, especially when magnesium is deficient. 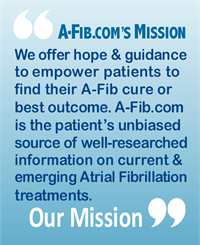 According to Dr. Andrea Natale, Executive Medical Director, Texas Cardiac Arrhythmia Institute, ‘calcium overload’ is the primary factor in A-Fib remodeling of the heart, i.e., structural changes to the heart, including enlargement of the atria and the development of atrial fibrosis. VIDEO 2: “Importance of Balancing Calcium & Magnesium“. Dr. Carolyn Dean, author of The Magnesium Miracle, discusses the importance of balancing calcium and magnesium supplementation. She looks at the benefits of both and why you need to have both in the body. (2:30) Posted by iHealthTube.com. Aim for more Magnesium vs. Calcium: A-Fib patients may need to stop or lower significantly their calcium supplements and increase magnesium. Aim for a ratio of one part Calcium to two or more parts Magnesium. It’s good to keep track of how much Calcium you are taking in daily, so that you can be sure to take in more Magnesium than Calcium. Testing for Calcium: A serum calcium test in the range of 8.6-10.2 mg/dl is considered normal, but one/half of the calcium in blood is attached to proteins (like albumin). A more accurate calcium blood test looks at “ionized calcium” which is calcium not attached to proteins. But this is a specialized test and probably isn’t necessary for most people. Potassium (K+) is often the second key nutrient A-Fibbers may be deficient in. In fact, magnesium depletion can lead to potassium depletion. Low magnesium leads to low tissue potassium, since magnesium is needed for potassium transport into tissue. When potassium levels are too low, heart cells become unusually excitable, often leading to premature contractions and/or A-Fib. But to insure you’re getting the amount of potassium you need, it’s often necessary to take potassium in supplemental form, in addition to foods rich in potassium. Here’s my potassium recommendations. Beware: some brands offer 540mg tablets, but the actual dose of Potassium Gluconate is only 90 or 99 mg per tablet. Start slow: As with magnesium, start off low, one teaspoon/day, and increase the dosage every 4-5 days. The goal is to keep the serum blood potassium level at 4.5 but under 5.0. A word of caution—adding too much potassium too soon will make A-Fib worse, not better. Too much potassium in blood plasma makes the cardiac cells depolarized and unexcitable, leading to spontaneous activity in other areas of the heart such as in the Pulmonary Vein openings. If you don’t spend much time in the sun or always cover your skin (sunscreen inhibits vitamin D production), you’re probably deficient in Vitamin D. Known as the sunshine vitamin, vitamin D is produced by the body in response to sunlight, and occurs naturally in small amounts in a few foods including some fish, fish liver oils, and egg yolks. A 2009 study estimated that as many as 77 percent of Americans are vitamin D deficient. Excessive Vitamin D is rare and is not caused by excessive exposure to the sun, or foods containing Vitamin D.
Vitamin D deficiency contributes to the development of both A-Fib and Dementia. 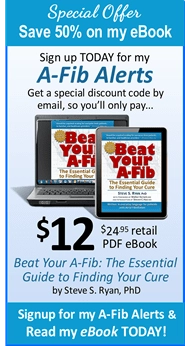 (See Boston AF 2011: A-Fib and Dementia by Dr. T. Jared Bunch.) Vitamin D helps the body absorb calcium. A deficiency in vitamin D can cause an imbalance in Magnesium and Calcium, and contribute to heart palpitations. Vitamin D deficiency contributes to the development of both A-Fib and Dementia. Ask your doctor for a “25-hydroxy Vitamin D Test” or use an in-home Vitamin D test available from the Vitamin D Council. Vitamin D deficiency is defined as a blood 25(OH)D level below 20 ng/dL. Normal levels are considered to be above 30 ng/dL. Vitamin D from sun exposure: 5–30 minutes of sun exposure between 10 AM and 3 PM at least twice a week to the face, arms, legs, or back without sunscreen. Vitamin D is found in supplements (and fortified foods) in two different forms: D2 and D3—both increase vitamin D in the blood. The RDA for adults is 600 IU and 800 IU for seniors (mostly from sun exposure). You should retest after three months of Vitamin D supplementation. For adults who aren’t getting vitamin D from the sun, the recommended supplement is: 200 IU of vitamin D a day for adults under 50 and 400 IU for adults 50 to 70 years of age. Many doctors are advising their patients to take much higher amounts, such as 1,000 IU a day. You should retest after three months of supplementation. The dose of vitamin D may need to be adjusted based on the test results. In the US, vitamins and mineral supplements are not regulated by the FDA (or any other government agency). Quality and potency will vary. 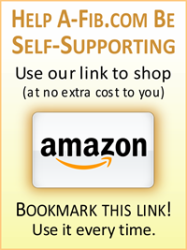 So, it’s up to you to find reliable, unbiased information to evaluate the vitamins, minerals, herbs or supplements and to select reliable brands and products. In our search for unbiased sources, we looked at many, many informational directories. Three searchable databases rose to the top of our list. See Our Top 3 Sources for Reliable, Unbiased Info on Vitamins and Supplements. • Whitaker, Julian. Health and Healing, March 2011, Vol.21, No. 3, P. 3. • Van Wagoner, David R. J Mol Cell Cardiol 32, 1763-66 (2000) doi: 1006/jmcc.2000. 1224. Are Your Herbal Supplements Interacting With Your Medicines?